‘‘WE WILL NEVER FORGET!’’ Trump tweeted, along with the video. ‘‘The memory of 9/11 is sacred ground, and any discussion of it must be done with reverence,’’ Pelosi said. ‘‘The President shouldn’t use the painful images of 9/11 for a political attack. On Thursday, the New York Post had helped set the tone for the president’s tweet by publishing a front page that showed her comments over a similar image. The speech had drawn a protest outside at the time and even news coverage from conservative-leaning outlets such as the Washington Times, which noted that she told fellow Muslims to ‘‘raise hell,’’ and ‘‘make people uncomfortable,’’ as they sought to defend their rights. But on Saturday morning at a townhall in a seafood restaurant near Charleston, South Carolina, O’Rourke described the president’s tweet and the video it contained and then denounced it in a monologue that lasted several minutes. As he spoke, many in the crowd gasped or exclaimed at the description, then applauded O’Rourke’s response: that the video is a continuation of rhetoric used by the president and his administration against Mexican immigrants, asylum seekers, Muslims and others. At the end of a roundtable with voters in Gary, Indiana, Sen. Bernie Sanders, I-Vt., hinted at the controversy over Trump’s attack on Omar, saying that ‘‘the function of a president is bringing our people together,’’ and that the current president was failing at that. ‘‘Even conservative presidents have understood that,’’ Sanders said. 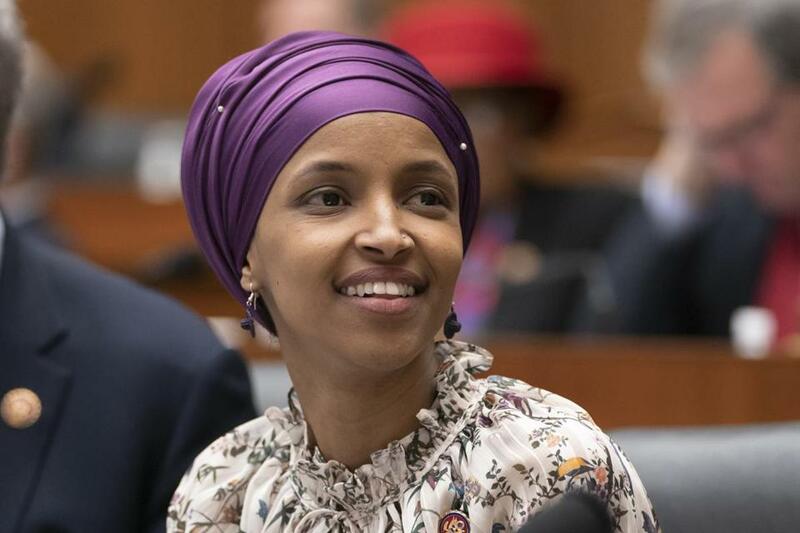 Numerous House colleagues came to Omar’s defense, and her fellow freshmen issued a forceful response to Trump’s words. Reps. Alexandria Ocasio-Cortez, D-N.Y.; Ayanna Pressley, D-Mass. ; and Rashida Tlaib, D-Mich., called for more Democrats to speak out to defend her this week. Several Democratic presidential candidates, including Washington Gov. Jay Inslee, South Bend, Indiana, Mayor Pete Buttigieg and Julián Castro, a former housing secretary and San Antonio mayor, condemned the president’s remarks. Trump has long wielded 9/11 as a political weapon. In the early part of his presidential campaign, he spread a falsehood that ‘‘thousands,’’ of people in New Jersey - where there is a ‘‘heavy Arab population,’’ he said - he celebrated as the twin towers came crashing down. During a primary debate in 2016, he went after rivals like Jeb Bush and Sen. Marco Rubio, R-Fla., over George W. Bush’s failure to prevent 9/11. ‘‘The World Trade Center came down during your brother’s reign. Remember that,’’ Trump told Bush. The Washington Post’s Jenna Johnson contributed to this report from South Carolina. David Weigel contributed from Indiana.